Non-professionals, must not install and disassemble the lamps. ✔ EASY INSTALLATION. Bypass the ballast and the hassle! Ballast bypass required, power must be applied to both ends of the tube. Standard international 8' T8 tube shape. ● SAVE 57% ON YOUR ELECTRICITY BILL. 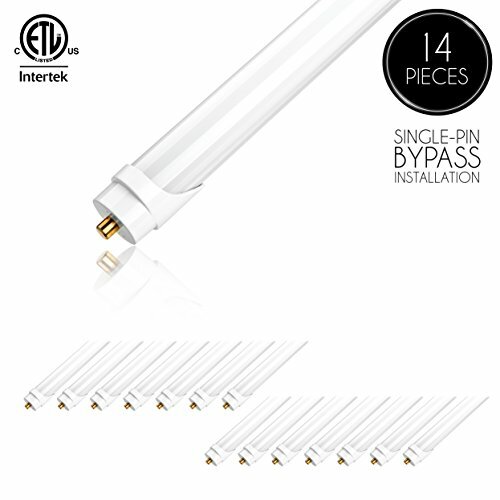 Use a 48W LED T8 tube to replace 110W fluorescent tubes and save 57% on your electric bill. Avoid frequent bulb replacement when switching to a T8 LED which has a lifetime of 45,000+ rated hours (21 years with 3 hours/day 365 days). ● SHATTERPROOF. These T8's are designed with a frosted shatterproof film protected glass housing which allows for safe installation in fixtures, with or without wire guards. ● SPECS: Frosted Cover, ETL-Listed to avoid electrical shock and fire hazard. 120-277V AC, 180° Beam Angle, FA8 Single Pin Base. ● 5 YEAR UNLIMITED WARRANTY. Parmida LED Technologies' 5 year warranty provides you with ease of mind.